The Ireland assistant boss is set to appear at a Cobh Ramblers charity game. 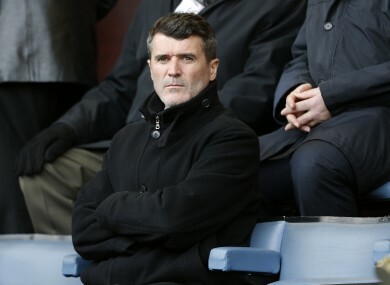 Roy Keane pictured in the stands at the recent Burnley-West Brom game. 25 YEARS AFTER leaving Cobh Ramblers to join Nottingham Forest, Roy Keane is returning to his first senior club for one night only tonight. According to the club’s official Facebook page, Keane will appear at the game alongside other ex-players including Patsy Freyne, Mossie Mahony, Len Downey, Fergus McDaid and Mick Devine for a charity match at St Colman’s Park against Springfield FC, with kick-off scheduled for 7.30pm. Tickets for the game, which is in aid of Cobh Community Hospital, cost just €5 and are available at the gate, while kids get in for free. Keane scored once in 23 appearances at the start of his career for the Irish side, before moving to England to join Brian Clough’s Nottingham Forest. The Ireland assistant boss has been in the news lately, as he has been one of the many names linked with the vacant Aston Villa job. Email “Roy Keane is returning to where it all began for him tonight”. Feedback on “Roy Keane is returning to where it all began for him tonight”.